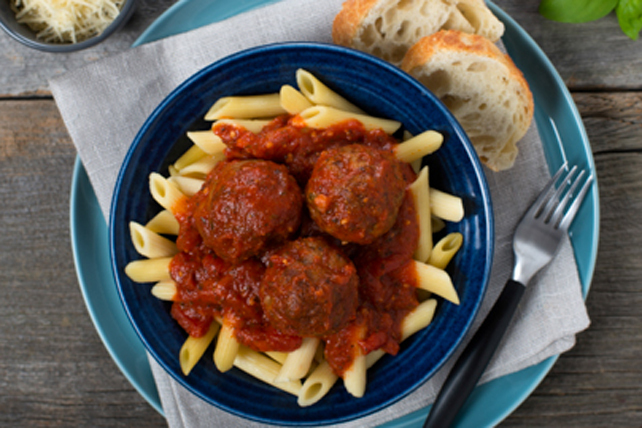 Mix first 4 ingredients just until blended; shape into 16 (1-inch) meatballs. Heat oil in large nonstick skillet on medium heat. Add meatballs; cook 3 to 5 min. or until evenly browned, turning occasionally. Stir in pasta sauce; cover. Simmer on medium-low heat 15 to 20 min. or until done (165ºF), stirring occasionally. Meanwhile, cook pasta as directed on package, omitting salt. Drain pasta. Serve topped with meatballs and sauce. Prepare recipe using Classico di Roma Arrabbiata Spicy Red Pepper Pasta Sauce. Top each serving with 1 Tbsp. Kraft 100% Parmesan Grated Cheese.